Last post, I talked about the number one question I get about Pugmire (“Can I play as my favorite breed?”). Today, I want to cover the other side — my number one criticism. Time and again I’ll wade into a forum thread or Facebook post about Pugmire, and someone will say “Oh, that’s just D&D with dogs.” And that’s both right and wrong. Yes, it’s based on the d20 OGL used for 5th edition Dungeons & Dragons. And unlike some OGL-based games, the surface layer (what I call the “output”) looks and acts a lot like 5e D&D. But the mechanics that drive the game (what I call the “engine”) are distinctly different. I tend to call it a “streamlined” version of 5e, but even that’s not entirely right. I’ve spent a lot of time challenging core assumptions, adapting new ideas, and seeing how each piece impacts the others. For example, rather than having a pre-constructed set of abilities, I presented a series of options so players can pick and choose the tricks that make sense to them. I also needed to find ways of mechanically representing some of the concepts unique to Pugmire, such as the artisans (which is somewhere between a bard and a wizard). But I wanted to keep that “classic fantasy gaming” feel. 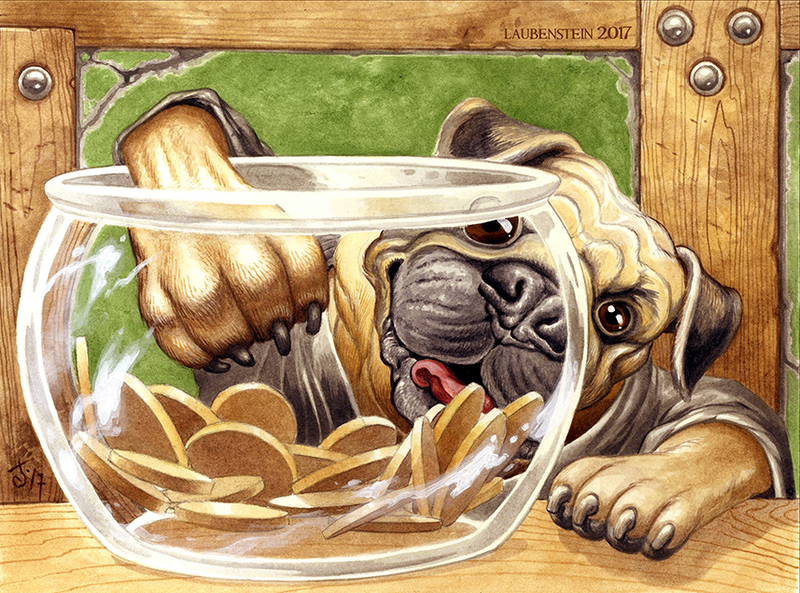 I’ve mentioned in a previous post that one of the central themes of Pugmire is nostalgia, and D&D holds a nostalgic place in my heart (and indeed, in the hearts of many gamers). But nostalgia isn’t memory — it’s a polished and refined view of history, smoothing over the rough edges and focused on the parts that brought you joy. So it’s the same with the system — something that looks and plays more like the D&D I remembered over the D&D that actually existed. I also wanted to deemphasize record-keeping and mechanical incentives to kill. That’s why there are no experience points or loot beyond relics: The design cycle of D&D is “kill monsters, gain treasure and XP, use those to become more powers, kill bigger monsters.” There’s nothing wrong with that cycle — it’s worked for over 40 years, after all — but it wasn’t what I wanted for Pugmire. Anyhow, the output is (largely) compatible with 5e D&D. If you take a bit of 5e OGL design and bolt it onto Pugmire, it’ll mostly work as intended — you may need to fiddle with some bits, but it doesn’t take a ton of design experience to make it work. That was my ultimate goal. But it’s the difference between restoring a classic car as it was, and installing a modern engine, Bluetooth audio hookups, and a satnav into a classic car. In the end, if you drove each car separately, you might consider them equivalent, but if you carefully compared them side-by-side, you’d see a whole host of small changes and differences. Neither is inherently better than the other, but some people will have preferences to one style of restoration over the other. Previous entry Now Available: Wraith: The Oblivion 20th Anniversary Edition!